Found in Translation: Design in California and Mexico, 1915–1985 is a groundbreaking exhibition and accompanying book about design dialogues between California and Mexico. Its four main themes—Spanish Colonial Inspiration, Pre-Columbian Revivals, Folk Art and Craft Traditions, and Modernism—explore how modern and anti-modern design movements defined both locales throughout the twentieth century. Half of the show’s more than 300 objects represent architecture, conveyed through drawings, photographs, films, and models to illuminate the unique sense of place that characterized California’s and Mexico’s buildings. Crystal Cove State Park is one of Orange County’s largest remaining examples of open space and natural seashore. It features 3.2 miles of beach, 2,400 acres of backcountry wilderness and an offshore underwater area. 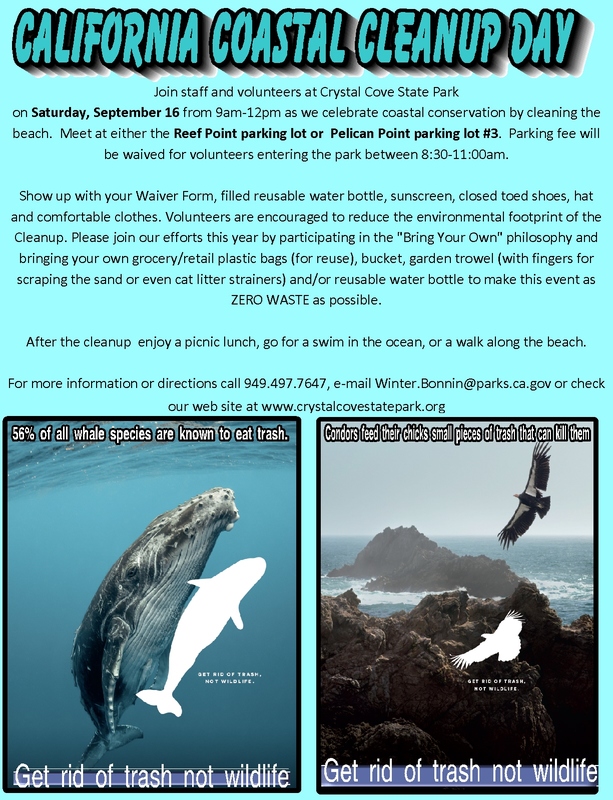 Come help clean this beautiful stretch of Southern California coastline. Converge 2017 will analyze the creative process, driven by new software, techniques, materials and manufacturing methods, which designers and engineers alike employ to reach their goals faster. Converge 2017 will analyze the creative process, driven by new software, techniques, materials and manufacturing methods, which designers and engineers alike employ to reach their goals faster. At Converge, thought leaders from different industries will share their experiences and visions on design and manufacturing in and for a global market, driven by market and technology trends such as 3D printing, Internet of Things, High-Performance-Computing, and more. Learn about Natural Agriculture and how to grow food in pure untreated soil. This is a great chance to commune with nature and revitalize your spirit at Shumei’s Natural Agriculture Garden in Hollywood! If it is your first time visiting, please call (323)876-5528. Spend the morning with the owners of Atwater Village’s famed Potted store and celebrate the publication of their new book, Potted: Make Your Own Stylish Garden Containers. Enjoy a short demonstration and light refreshments, and have Annette and Mary sign your book. One lucky person will go home with a Potted container planted with a California native! The Los Angeles Cactus and Succulent Society hosts a one-day sales event promoting the growth and appreciation of “rare and unusual cactus and succulent plants”, with handmade ceramics, top dressing, decorative rocks, and more.